Whilst the band only appeared fleetingly in the USA during the Sons And Fascination tour, it was realised that they were woefully represented in that country. Only Life In A Day had appeared as a domestic release in the New World, the rest of their back catalogue only available as expensive imports. This was rectified by a releasing a compilation on Stiff Records, a solo album deal. 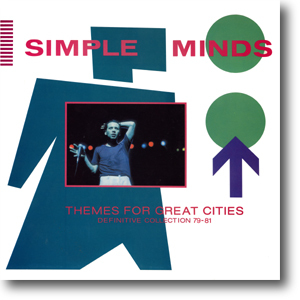 Themes For Great Cities collected the choice cuts from their imports, creating a definitive collection from Real To Real Cacophony, Empires And Dance, Sons And Fascination and Sisters Feelings Call. A promotional sampler, the oddly named Urban Sampler , became a sought-after collectible. Gold stamped promo versions of the album also circulated. Malcolm Garrett designed the sleeve for the compilation, basing it on his early Sons And Fascination style. This was subsequently used by Virgin Mexico when they issued their version of Sons And Fascination.